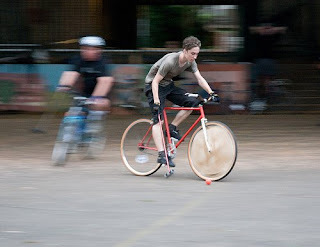 shanghai bike polo: what kind of bike do i need? this is another really popular question i have been getting . . i think maybe people are just intimidated when they see my riding my fixed gear bicycle. the truthful answer is : any kind of bike! whether it is a mountain bike, a bmx bike, a single speed bike, or a fixed gear - anything will work. naturally some bikes have advantages over others, and fixed gears are the preferred bike to play with, but any bike will do. if you've got a bike, contact me if you'd like to play! bike polo round 3 !! bail! and some sweet snaps. making history in shanghai : the video ! photos courtesy of chris ! mark your calendars : round 2 is here !! photos courtesy of rich ! thanks for a great turnout ! mark your calendars : the launch party is here !! how to build polo mallets ! if you'd like to play, contact me! how do you play bike polo? how to start a league?